There is one wonderful thing about golf. You are never to young or too old to learn how to play this game. Unlike other of the more physical sports like football and hockey you are limited on how long you can effectively play these just due to the physical requirements to do so. Now golf, well golf is a different story. I know a lot of people who are well up in their years and they still play a decent game of golf. The best part of this is, it doesn’t matter if you are a man or a woman you can play this great game for many years. 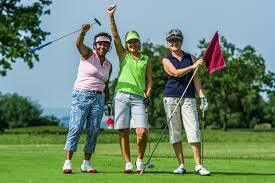 In this article I am going to dedicate it to golf for women over 50 years of age and older. Let me start here by telling me a little about myself and my wife, Beth. We both grew up in a suburb of Philadelphia called Delaware county. We have been together for like 40 years now. We have raised two beautiful daughters and now have 3 awesome grandchildren. So let me get to my point here. Every Sunday morning I would get up at 6:00 am and head to my local golf course to get ready to play a round of golf with all my local buddies at our golf club. Beth just never understood this, You have a day off from your demanding job all week and you want to get up this early to play this silly game of golf. So let’s fast-forward here fifteen years. Our children are grown, out of the house and have families of their own. We decided we did not need our large house anymore and wanted to downsize our lives. We sold our house and moved from Pennsylvania and moved to the South Jersey Shore area. We purchased a home in a 55 year or older community. It is a very nice community with a pool, a recreation center and of course, a golf course. I spend most mornings at the golf course and then my wife would come and meet me for lunch. One day we were sitting having lunch outside, overlooking the 18th green and my wife mentioned to me she has been thinking about taking up golf, and asked me what I thought of it, of course I was all for it. She mentioned that maybe she was too old to start playing golf at this stage of her life. My wife has always kept herself in pretty good shape, so I told her, nonsense, let’s go for it. When first getting started in playing golf one of the first fears you will need to overcome is the intimidation factor that you are going to go out to the driving range and make a fool of yourself. Everyone has to start somewhere, and yes, you will not have a great golf swing right out of the gate. If you live in a community with a golf course or just belong to a country club, the first thing you should do is hook up with the club pro golfer and take a few lessons just to get the feel for the basic golf swing. They are really not that expensive but well worth the investment. Most golf courses will even give you loaner clubs to used to make sure you enjoy the game before going out and investing in your own golf clubs. Once you have your basic golf swing down with your driver and your mid and long irons you will need to learn what is called the short game in golf. The short game consists of your chipping, putting and sand trap shots. This is where your husband or partner can come into play to teach you these aspects of your golf game. 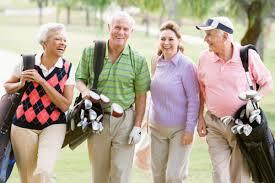 Chances are they have been playing golf for some time now and are very knowledgeable in these areas of golf. Just about every golf course has a practice putting green, a chipping area, and a sand trap to practice from. The two of you can go out and practice these shots just about any time you want. You can eventually make a little competition out of your practice, making it more fun for the two of you. Practicing can get boring at times. Another learning tool is golf magazines. They always have a large array of golf lessons and instruction in them. Then of course there is the internet. You Tube videos about golf are out there by the thousands. 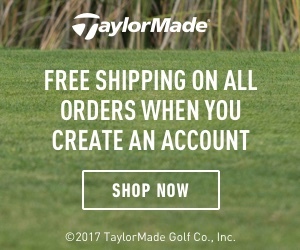 You can pull up golf video’s about any golf shot you could ever think of. So if you have gotten this far and you feel that golf is really something that you want to seriously get into then the next thing you will need to do is go out and get yourself your own set of golf clubs. Ever since women’s golf has become more and more popular it has also become much easier to purchase women’s golf clubs. Men’s clubs are much different from women’s clubs, so I suggest you go out and get fitted for your set of golf clubs tailored to your height, weight and swing. Most golf fitting shops will probably recommend a graphite shaft for the woman golfer. It is much lighter than a steel shaft which will give you more swing speed, therefore more distance with your shots. The next thing you need to take into consideration is the length of your golf clubs. If you try to play with golf clubs that are to long your golf game will suffer tremendously. If you have to have your clubs custom-made it will be worth it in the long run. The weight of your golf clubs is very important. In this day and age golf clubs can be weighted on the fly. In other words most golf shops have swing analyzers and they will let you use clubs of different weights and look at the results on a monitor and see what the perfect weight of golf club you need. As in any sport you have to be in pretty good shape to play at an optimal level, and Golf is no exception. 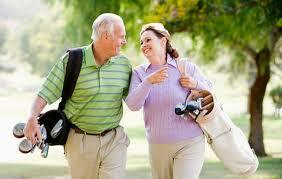 The main thing about golf fitness for women over 50 is you do not need any kind of muscle mass to excel in the sport. The most important element in golf fitness, no matter what age you are is flexibility. A good deal of golf fitness exercises you can do just about anywhere. You do not need any large barbells or exercise equipment to get in golf shape. In fact, you can just go to an article I did on best golf fitness exercises for women by clicking here: Here you will find all you need to get in the best golf fitness of your life. 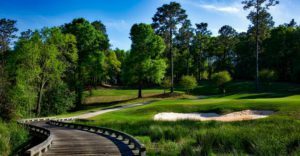 Getting back to the beginning of this article where my wife and I moved to this new +55 community with a golf course and she decided to take up the game of golf, our live’s have changed drastically for the best. She has actually gotten pretty good and occasionally has broken a 100 a couple times. Not bad for someone who has played for one season. The best part about her decision to take up golf has got to be the social interaction and the wonderful people we have met. She has joined the ladies golf club and plays golf with them every Wednesday where they have first crack at morning tee times and they make a social day out of it. Going hand in hand I have met many of the partners that she plays golf with and I in turn now play golf with a lot of them. It has turned into a win, win situation. We have created friendships that I’m sure will last for many years and for that we feel blessed. This has all come about because of this silly little game called golf. I just want you to know that you are never too old to start playing this wonderful game of golf. Golf for women over 50 is totally doable. Just always remember in the beginning golf can be very scary and intimidating but just don’t throw in the towel. The journey can very frustrating at times but just hang in there and keep practicing. Always remember it is only a game and is meant to have fun with. There is never any reason to get angry or disrespectful on the golf course and ruin someone else’s day. Learn the proper etiquette of the game and adhere to it. I hope you have enjoyed my article here on golf for women over 50 and have learnt some valuable information here; As always, if you have any questions feel free to ask me and I will try to respond promptly. Also, please feel free to leave a comment below as your opinion is always valuable to me.